Published: Mar 29, 2019 - Modified: Mar 29, 2019 - by Chef Rodney - Leave a Comment - This post contains Ads & Affiliate Links. Tacos make a regular appaerance in my house. Egg Tacos for Breakfast. Chicken Street Tacos for lunch or Carnitas Tacos for dinner. Maybe it’s living in Southern California that has that effect on us but we could eat tacos ecery day if we could. I’ve had dozen of different tacos over the years. Whether it’s chicken, pork, beef or turkey, been there done that. 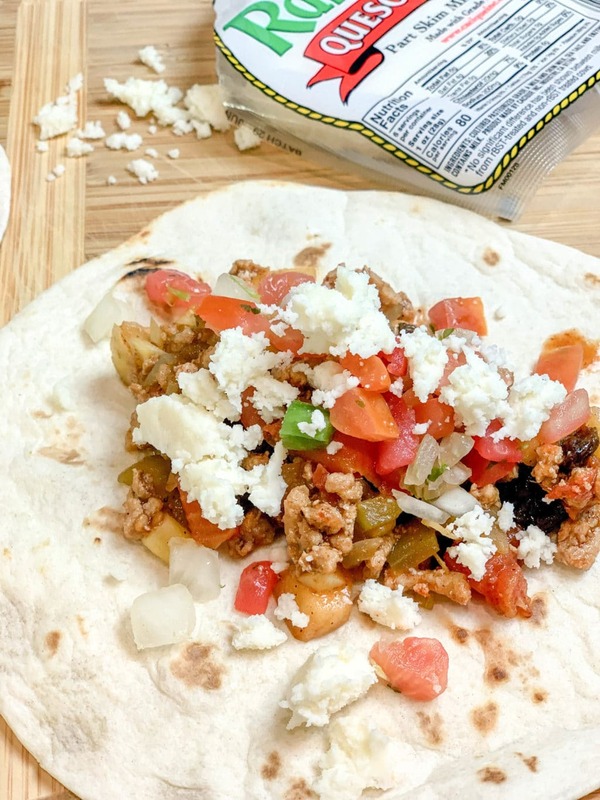 But this Turkey Picadillo taco filling is probably one of the most unique tacos I’ve ever eaten. 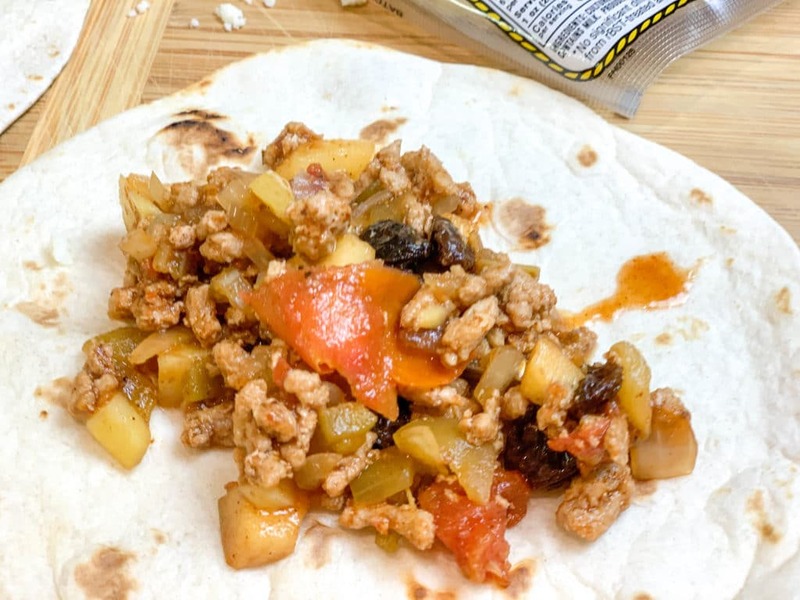 Potatoes, apple, raisins, green chilies, cinnamon, yeah, this is one unique taco filling. It’s very similar but different than Ofelia’s Cuban Picadillo. While they share the same name and both equally delicious, they are very different. I suggest you try both recipes and let me know what you think. Heat a large skillet over medium heat. Add the ground turkey and cook until browned. Add the onion, chilli powder, and cumin and mix in well, breaking up clumps of meat with a fork. Stir in the apple, green chilies, potato, tomatoes, and beef broth. Simmer covered 15 minutes. Stir in the remaining ingredients and cook uncovered about 10 to 15 minutes or until vegetables are tender and most of the liquid has been absorbed. Adjust seasoning to taste. 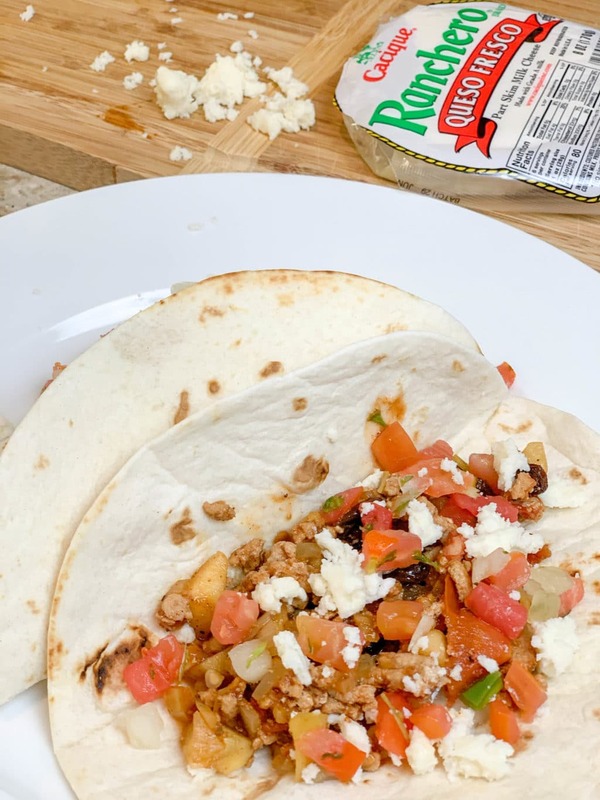 Put a generous spoonful of Picadillo in a softened warm tortilla, fold and optionally garnish with Pico de Gallo and Queso Fresco.